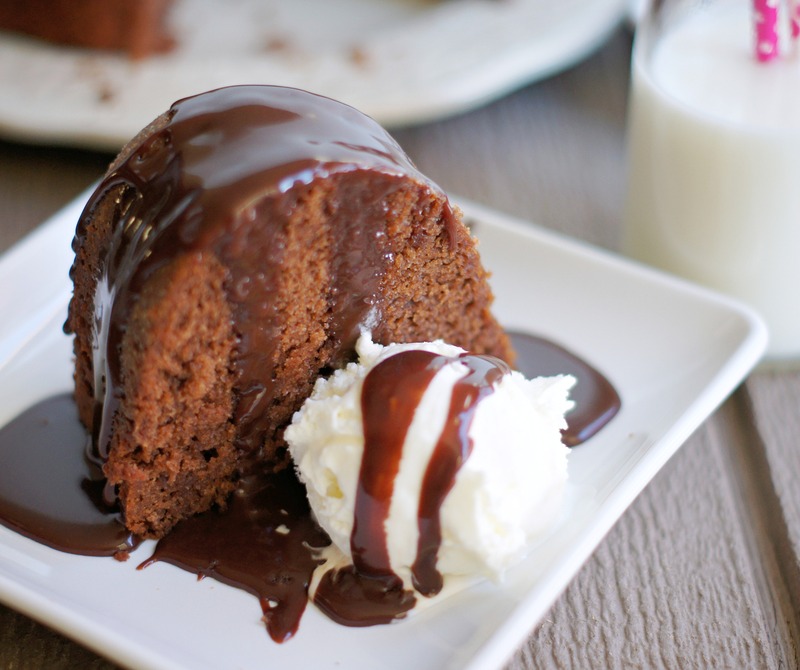 On the 1st Day of Sugar my true love gave to me Chocolate Bundt Cake with Hot Fudge Sauce. . . . . . Oh yes, the sugar madness has officially begun. For the next 12 days I will be sharing all sorts of dessert and treat recipes. There will some that are rich and decadent and some just simple and delicious. There will even be some yummy neighbor gifts ideas. So get your fat pants ready, sit down and buckle up because the sugar ride has begun. 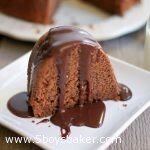 I’m starting off with this fabulous bundt cake. I love a good bundt cake and this one is really, really good. It’s dense, moist and not to sweet. You can leave it plain or you can take it up a notch by topping it off with this crazy good hot fudge sauce . . . it’s a perfect, simple dessert. If you want to make it really “holiday-ish” I highly recommend a scoop of peppermint ice cream. Store bought is fine, but my homemade is even better. But really, any flavor ice cream will do. One down, eleven more to go . . .
Preheat oven to 325 degrees. Spray a bundt pan with non stick cooking spray. Cream together the butter and sugar at medium speed until fluffy. Add eggs ome at a tme, beating well after each addition. Add vanilla and mix well. In a separate bowl whisk together the flour, cocoa, baking soda, baking powder and salt. Gradually add the dry mixture to the butter mixture, alternating with the buttermilk, beginning and ending with flour mixture, beating until just combined after each addition. Stir in sour cream. Bake 60 to 75 mins or until a wooden toothpick inserted into the center comes out clean. Let cool in pan for 10 minutes. Remove from pan and let cool completely on a wire rack. Serve with hot fudge sauce and ice cream if desired. To make hot fudge, combine chocolate chips and butter in a medium saucepan. Cook over low heat stirring frequently for 2 to 3 minutes or until chocolate chips are melted and smooth. Add powdered sugar and evaporated milk, whisking until smooth. Increase head to medium and cook, whisking constantly for 5 minutes. Remove from heat, stir in vanilla and let cool. 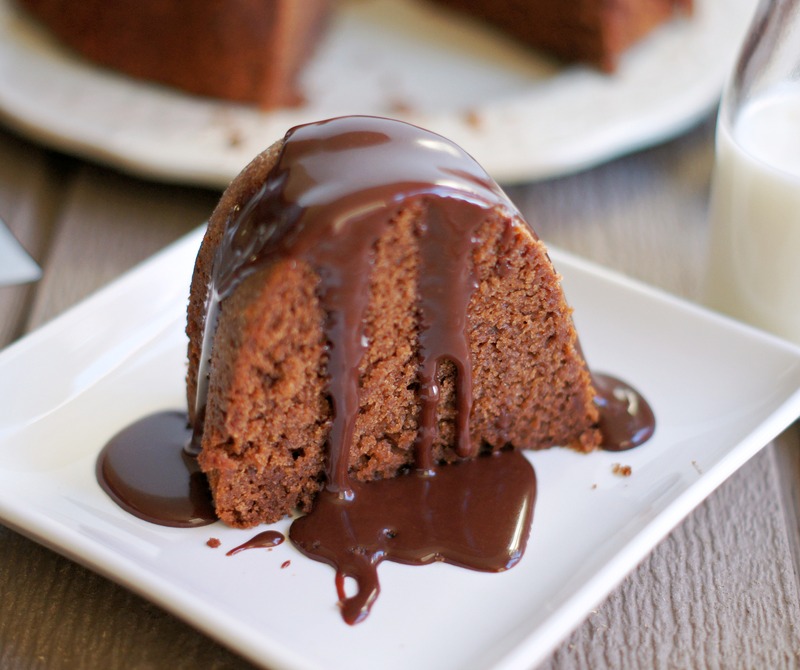 Serve over chocolate pound cake. This cake will keep for several days wrapped tightly in plastic wrap and kept in a cool place or the fridge. Fudge sauce will keep for several weeks stored in the fridge. Yummy! I made it already twice, but added a bit more sour cream. A question-you used the word notcy, which I couldn’t find in the dictionary. What is the meaning of the word “notcy”?